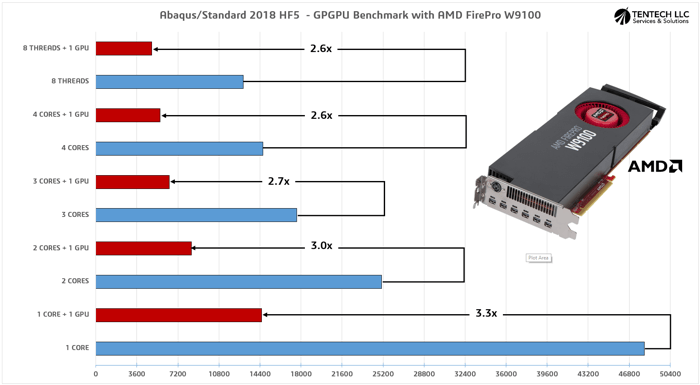 Abaqus/Standard acceleration with AMD FirePro™ W9100: the results are in! As promised, we're continuing our scalability testing of the Abaqus solver (Abaqus 2017 & NVIDIA Quadro GP100, Tesla K40 gives second life to ancient server, GPU Computing with Abaqus 2016, Abaqus 2018: Parallel Processing & GPGPU), we will be looking at the current release, Abaqus 2018.HF5. As always, the goal of our benchmarking is to evaluate what can realistically be expected from fairly powerful workstation configurations running Abaqus. Our series of test will involve GPU computing acceleration using the AMD FirePro™ W9100. To perform our tests, a single model will be used, comprised of around 4M dof. 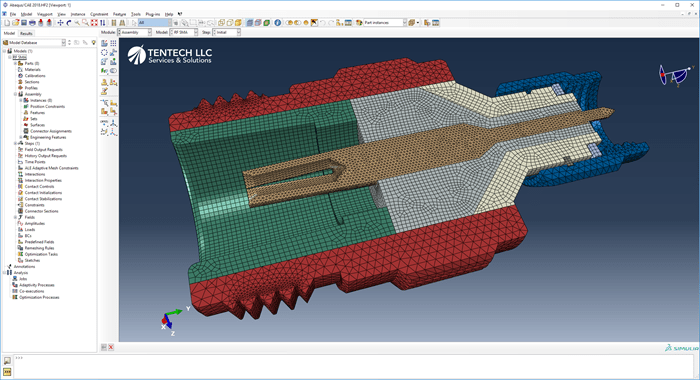 The solution will consist of a 2-step non-linear solution, pre-stress and surface-surface contact simulating insertion and extraction of tightly fit defense electronics RF connectors in its socket with the Abaqus/Standard solver. Although seemingly trivial, these types of analyses are complex and compute-intensive as friction, many local phenomena and multiple types of materials are involved. The hardware used in this article is an HP Z820 workstation running Windows 10 Pro sporting 64GB RAM, a quad-core Xeon E5-2643 v4 @ 3.3GHz and our AMD FirePro™ W9100 combined Graphics & Compute card. While the workstation is a little dated, the AMD card brings it back up to decent standards in terms of computing power. As discussed earlier, Abaqus is able to re-route calculation instructions that are typically processed by the CPU to the GPU. The main advantage is the massively parallel nature of the current GPUs. In our case, the AMD FirePro™ W9100 offers 2,816 cores to process the Abaqus instructions, offering a peak 2.62 TFLOPS double precision. While it uses the CUDA library for NVIDIA GPGPU, Abaqus uses the OpenCL library with AMD hardware. A complete set of results, along with acceleration multipliers is presented below. Our initial solve of nearly 14h on 1 core sees a 3.3x speedup with the W9100, allowing us to solve this model in a little over 2h on 1 core and 1 GPU. This would allow us to get two runs in a day instead of having to wait for a single run overnight. Equivalent acceleration factors can be seen as we increase the core count to speed up the solution with CPUs, still getting a 2.6x acceleration factor with our 8 threads solution. Using the maximum resource of this workstation, the 14h solution time on 1 core can now be solved in less than 90min using 8 core and the GPU! This set of experiments, conducted over several days, confirmed the same trend we had experienced earlier with a more powerful workstation and the NVIDIA Quadra GP100: GPGPU with OpenCL on AMD FirePro™ W9100 brings performance boost of over 3x, and complement CPU parallelization very well. The ROI for GPU Acceleration with Abaqus/Standard is a very straightfworward calculation in this case, probably a couple weeks if not a few days.